Home > Law Books > Practice Materials > Litigating International Torts In United States Courts, 2018 ed. 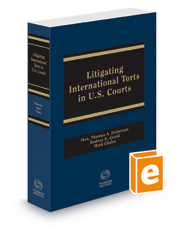 Litigating International Torts In United States Courts, 2018 ed. Wrongful death, personal injury or property damage caused to travelers abroad by foreign hotels, domestic hotels with facilities overseas, and domestic travel and travel-related corporations that make or book overseas travel, or their agents, employees, and representatives.